This article details the results of the most recent SWPP quarterly survey on critical workforce planning topics. In this survey, which focuses on the scheduling process, was completed by over 150 call center professionals representing a wide variety of industries. The largest percentage (45%) of the participants is from large call center operations with over 500 seats, followed by 16% with 100-200 agents. However, 14% of the survey participants represent centers with 100 or fewer agents. 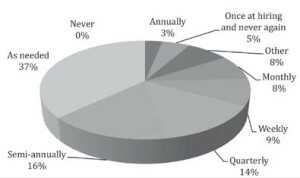 All types of call center operations were represented in the study, with the biggest percentages representing financial, insurance, healthcare, telecommunications, and Other (which includes all industries not named in the survey choices). There is significant variation in the frequency of assigning schedules to the agents. The most selected choice is “as needed” with semi-annual and quarterly chosen by 16% and 14% respectively. More frequent assignment was reported by 9% for weekly and 8% for monthly. The need to adjust schedules arises from significant changes in the workload that may be driven by seasons, marketing campaigns, product changes, and a variety of other business drivers. It is important to change as often as is needed to adjust to these changes, but not so often as to cause more than the necessary disruption in the lives of the agents. Many centers offer self-scheduling options for the agents. The vast majority offer the ability to request time-off with over two-thirds offering request for schedule swaps. Schedule change requests and request for extra hours are offered by approximately half of the respondents. Fully Automated Scheduling Options Of the centers that offer agent self-scheduling options, about half manage the process with a fully automated system requiring no manual approval or administration. However, about 40% automated none of these options. Processing these types of requests can be time consuming for the WFM staff and/or supervisors. In addition, giving the agents control of this important aspect of their work life can be viewed as a significant benefit. 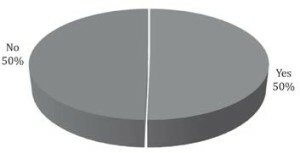 When asked to categorize the value of the various self scheduling functions to the agents, the respondents were offered low, medium, and high value or “don’t know.” The following chart shows the results of that question which suggests that the impact of these options can be significant. Survey participants were asked if they had policy restrictions in place for agent schedule change requests. 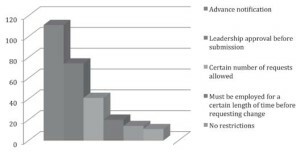 Over two thirds require advance notification while just under half require leadership approval before submission of the request. Less than 10% reported no restrictions on these requests. When asked how these restrictions impact the agents’ satisfaction, the options were once again low, medium, and high impact or “don’t know.” In this case, the percentage answering “don’t know” is higher than in the question above. While some restrictions may be necessary to maintain control of the operation, the impact of such restrictions on agent satisfaction should be considered before the policy is put in place. Scheduling in the contact center is one of the more challenging tasks. Finding that delicate balance of meeting the workload with an acceptable and consistent speed of answer along with agent satisfaction and resulting retention is not easy. It is clear from this survey that each center finds its own solutions to these challenges and that there is no one right way or industry standard approach that will work for everyone. The Fall survey will be available on our website soon. We hope you will participate.